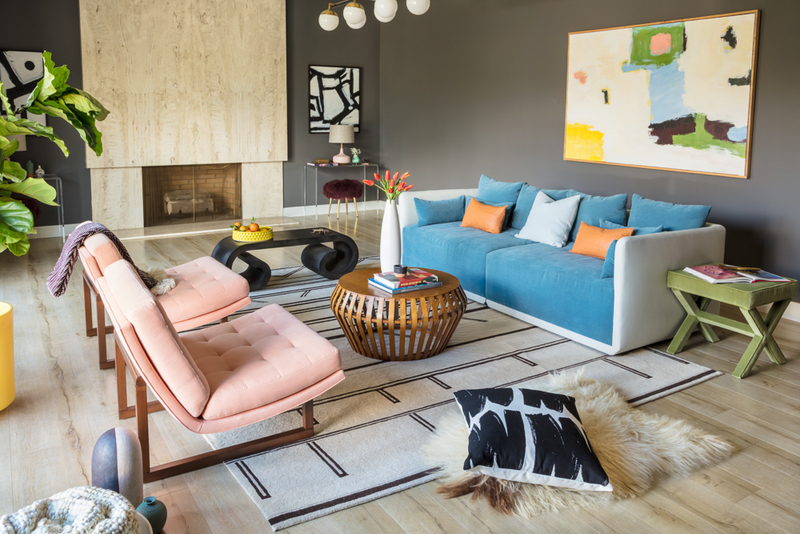 When a vibrant young family moved into a 1950s-era stunner once owned by the accomplished architect himself, they were at a loss of what to do with the large bonus room...along with wall and floor coverings that had been left beige for decades. Through integrating the most modern elements of both mid-century and regency design, a fresh take on the past emerged. The two influences elevate and pay homage to the classic characteristics of the home - all the while celebrating the exuberance of the inhabitants. 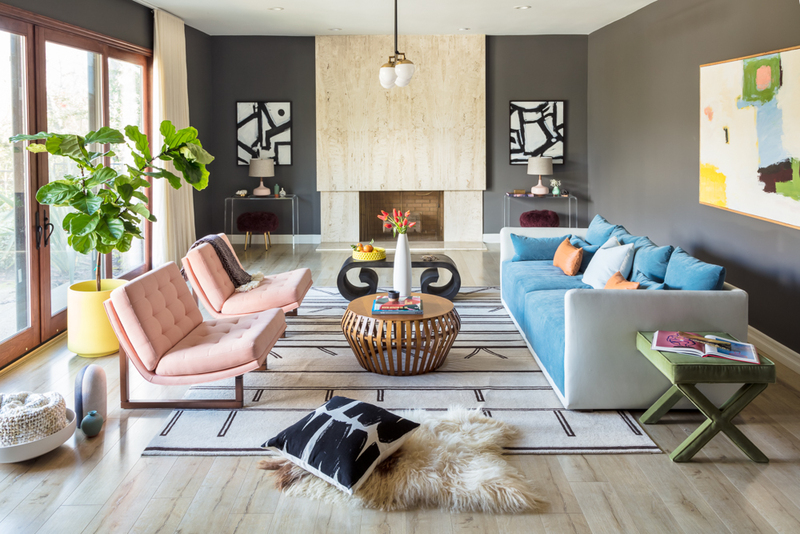 In a family room that's flooded with light, medium gray walls prove a perfect, velvety backdrop for abstract accents, punchy pastels and materials a-plenty. The original book-matched marble fireplace becomes a punctuation in an expansive interior thanks to contrasting paint and furniture that floats away from the permitter. 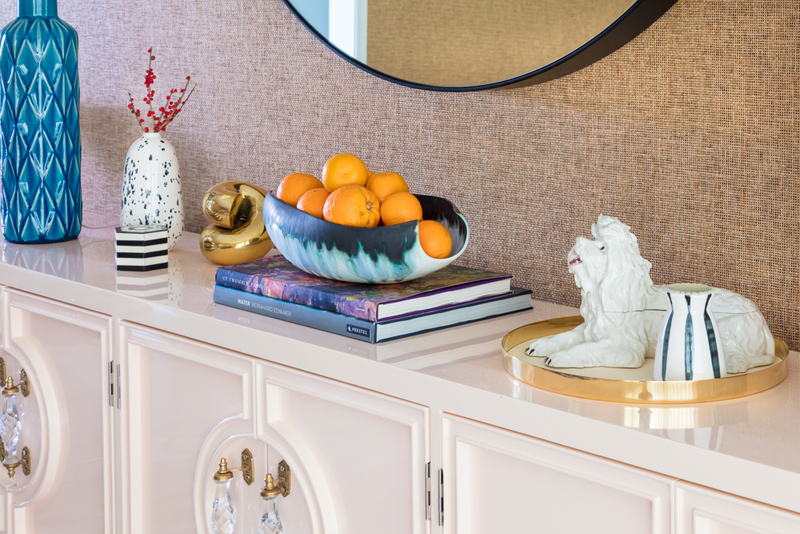 Warm and cool tones are unified throughout the space by way of curated furniture and accents that are thoughtfully woven through. A rich, natural-hued grasscloth lends luxurious yet laid-back dimension to the home's formal dining room. Finished with shimmery linen drapery, a graphic floral rug and hearty mix of vintage and modern accents, the space is simultaneously glamorous and accessible. In a large space, smalls are crucial. We love layering accessories of varying shape and scale to create a visually stimulating, collected aesthetic.